This is a breakthrough, even for me who often creates paleo or grain free recipes. I do this for all my readers who struggle with food allergies, diabetic diet concerns and those on a ketogenic or low-carb diet. Each serving is 6 net carbs! I had the genius idea to start with this grain free biscuit that gets better every time I make them. The key to the success of this biscuit getting high and fluffy is to make sure you use extra large eggs and really whip the whites well. If your egg whites aren’t gloriously fluffy, the biscuits will flop. Watch the quick video but make a double batch and add extra eggs. I’ve edited the recipe to add one more egg white as I accidentally did this and it improved an already great biscuit! Once the biscuits are cooled, (you must cook them), cut into big croutons. Gently bake for about 5 minutes or so to get them a little golden brown. Grain free biscuits do not act like gluten flour biscuits, so we do what we can to push them. I have found that keeping the croutons on the large size (larger than croutons you buy in the store) is best. If you happen to have any that turn into bread crumbs, dry and cool them completely and save them for another recipe. Once you have your toasted croutons, you’re ready to make your stuffing any way you choose, keeping in mind you will NOT need as much broth as regular recipes. Keep the broth to about 1 1/4 cups. One idea is to take a chicken broth and cook it way down to have some concentrated flavor. The broth you use makes a difference. I choose a good tasting organic broth. I like the Pacific brand and the whole foods 365 brand. Do not buy broth that has a lot of added unnecessary flavors. You can make your own with this recipe. Heat the broth first. It pulls the flavors together! Buy some fresh sage and make a sage brown butter. The flavor is to die for. Sauté your celery for at least 10 minutes ahead of the onion. Celery never wants to soften the same way onions do. 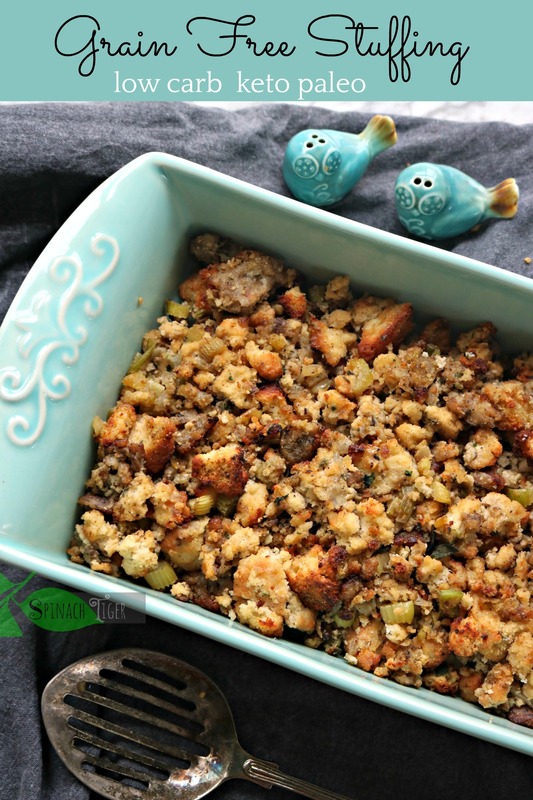 I don’t like crunchy celery in my stuffing, but if you do, then go ahead and put them in pan at the same time. Add sausage for flavor. If you have sausage drippings add them to the onion/celery combination. We like country sausage in this recipe, but Italian sausage is always welcome as we’re concerned. If you’re daring, use chorizo! In meantime, watch the video below for how to make the biscuits, but make sure to double the recipe. I find that with grain free recipes like this, it’s easy to veer off in the wrong direction. The video will help you stay on course. Don’t just eat this for Thanksgiving. You can stuff chicken breasts, chicken, pork chops, and so on. Another idea is to take left over chicken (or cooked chicken breasts), shred the meat and mix with the stuffing before baking. That’s a one dish meal! Here is what I did with the leftovers. Stir fry in a pan with butter, add arugula and a side of this sugar free cranberry sauce. Enjoy your holiday without guilt! Calculating 10 servings, this recipe has 6 net carbs per serving. 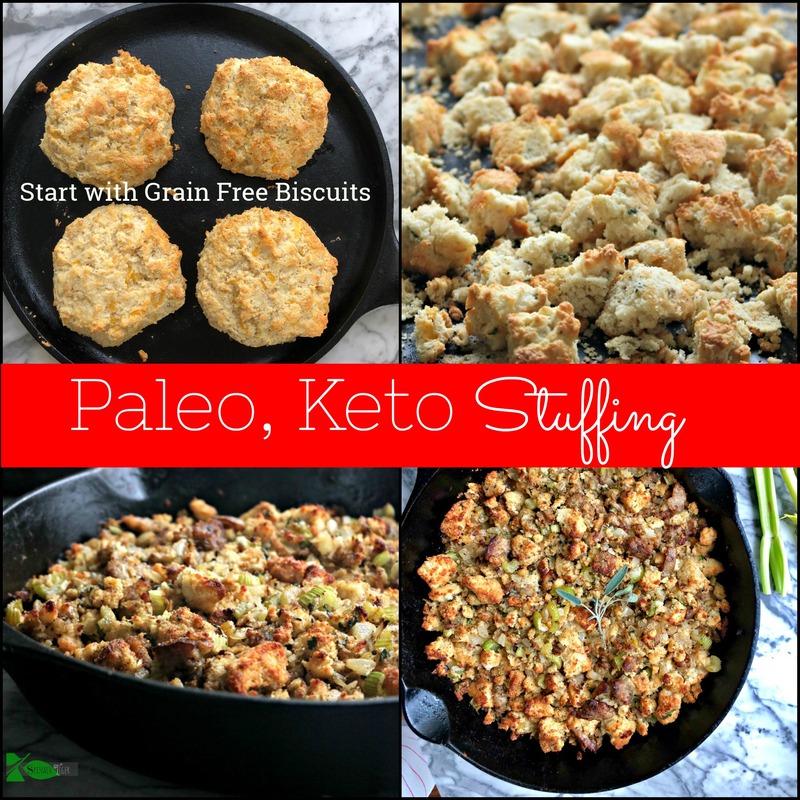 Grain free, keto friendy, Paleo Stuffing made with almond flour, coconut flour and perfect for any recipe where stuffing is in order. If not using sausage heat butter in pan. Add browned butter (see below) This is optional for extra buttery crunch, but you don't have to do this. Follow directions for grain free biscuits, doubling recipe. You can choose to add some freshly chopped sage, black pepper, and ¼ teaspoon poultry seasoning. Make ten large biscuits. A shallow dish works best to get the most crunchy top. I asked if I could make the grain-free biscuits dairy free using coconut oil. So I am all set to do that, but my intention was to make this great-looking stuffing. I notice this also calls for butter. 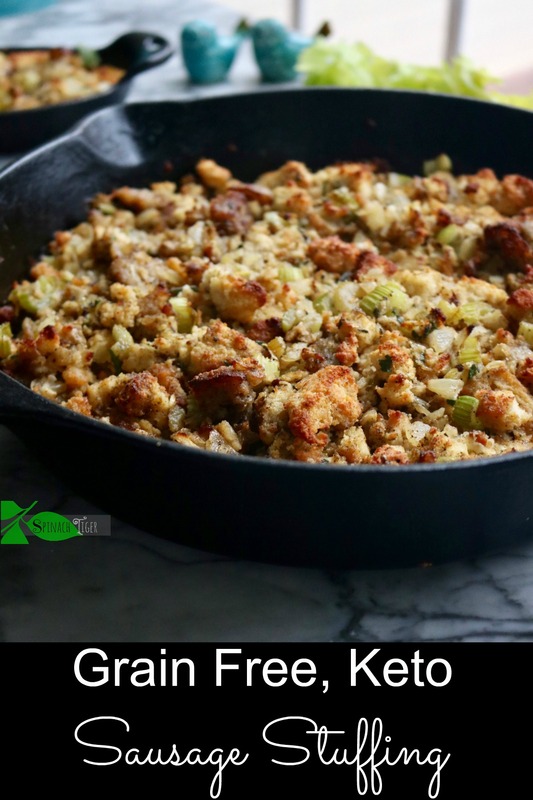 OK to sub coconut oil again to make this stuffing recipe dairy free? Anytime you see butter, ask is it for flavor or frying? I would probably use an olive oil for stuffing. That’s what my aunt did. She hated butter. You don’t need a lot just enough to sauté the vegetables. Coconut oil adds coconut flavor unless you use the refined (my preference). That or avocado oil are great substitutes for frying. I absolutely loved this recipe. Very easy to put together and so delish that family that are not even low carb (keto) were raving about it. More of this stuffing was eaten than the regular stuffing at thanksgiving. One word: yummy! 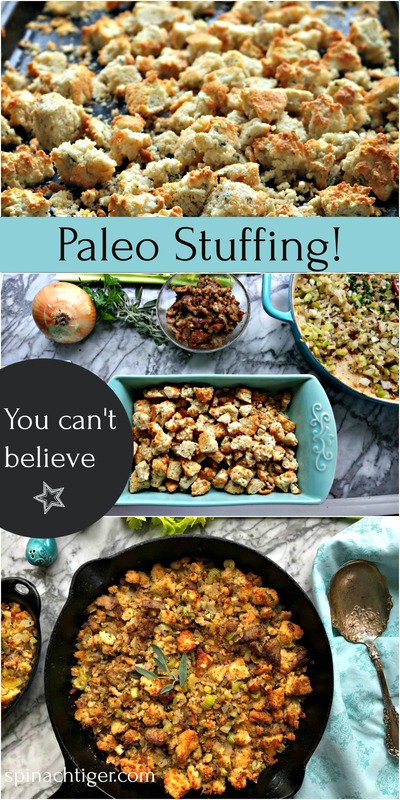 Can this stuffing recipe be prepared and refrigerated and then baked the following day? I got to sample it and I had no idea this was grain free. And in fact, I typically do not like stuffing, I’m more of a cornbread dressing guy, but I LOVED this. 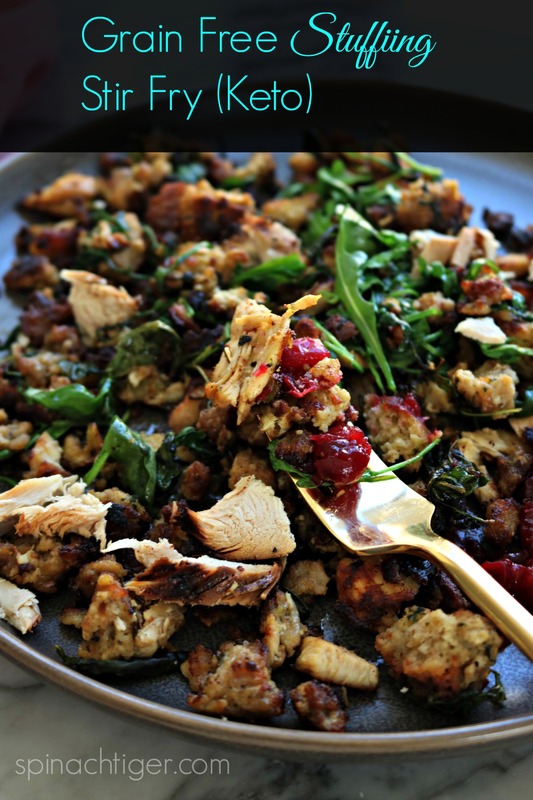 This stuffing recipe looks so amazingly good. I don’t think anyone would miss the grain at all.